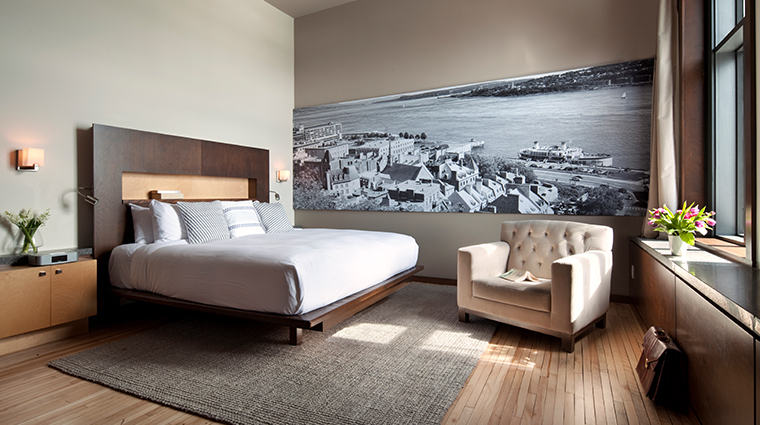 In the heart of Quebec City’s Old Port neighborhood — just steps from Place Royale, Petit Champlain and the Musée de la Civilisation— you’ll find Hotel 71, a charming 60-room boutique stay. 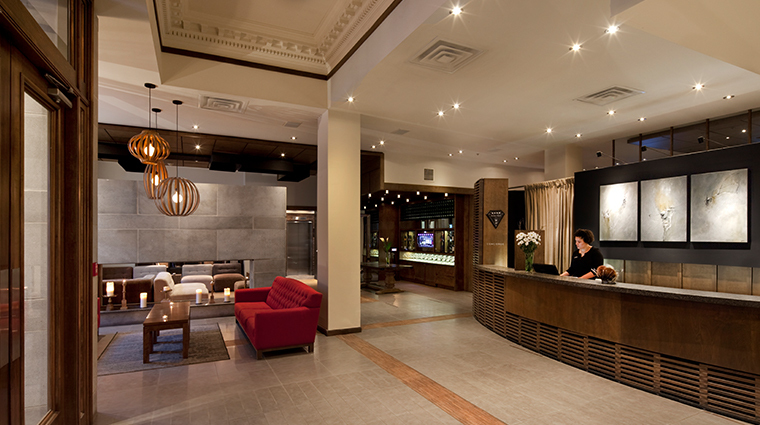 Housed in what was formerly the National Bank of Canada's first head office in Quebec City, Hotel 71 blends in with the historic surroundings. It boasts majestic 19th-century neoclassical architecture with 14-foot-high ceilings, beautiful windows that flood the public spaces and guest rooms with abundant natural light. 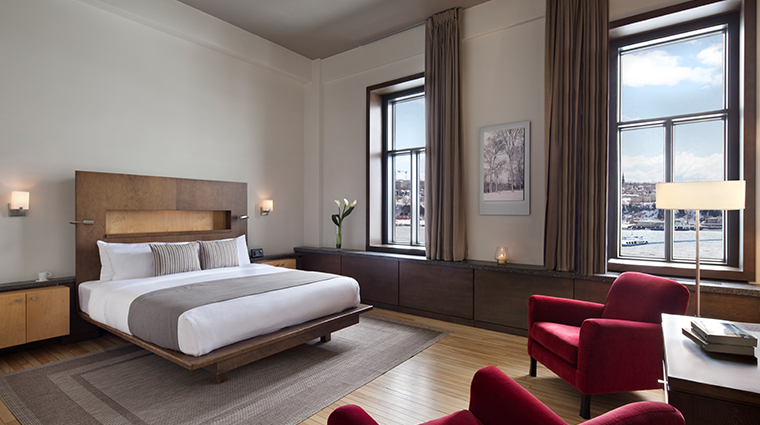 Otherwise, the interior of the hotel veers contemporary — rooms look minimalist but warm with hardwood floors; a color palette of white, brown with a pop of rich red; and clean lines. 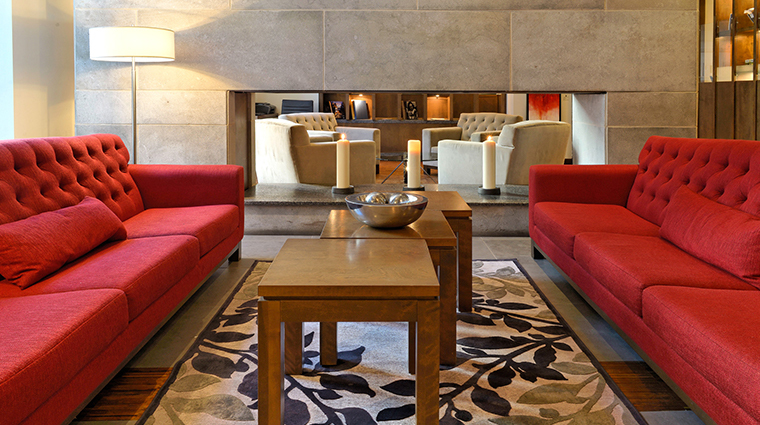 The walnut and limestone lobby beckons with wine. 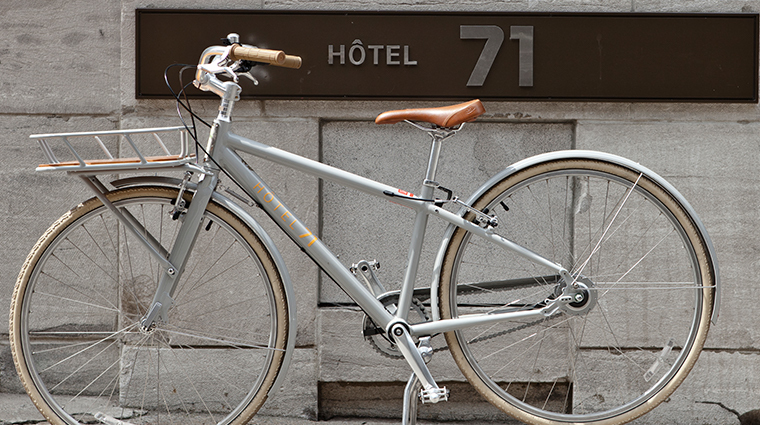 And when you want to leave the peaceful confines to explore the UNESCO World Heritage Site historic district, the hotel’s fleet of bikes awaits. Look up while in the hotel lobby and witness the exposed moldings that highlight the building’s previous incarnation as a prestigious bank. Some rooms in the western part of the property showcase original features like steel doorframes that were once used for safekeeping. 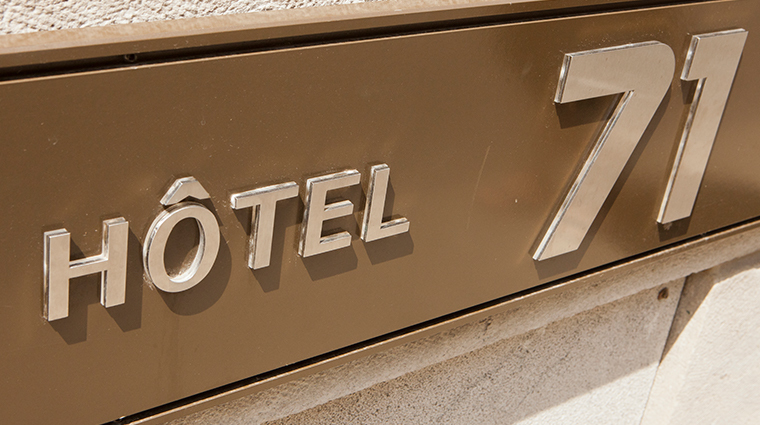 Hotel 71 has its own signature fragrance. 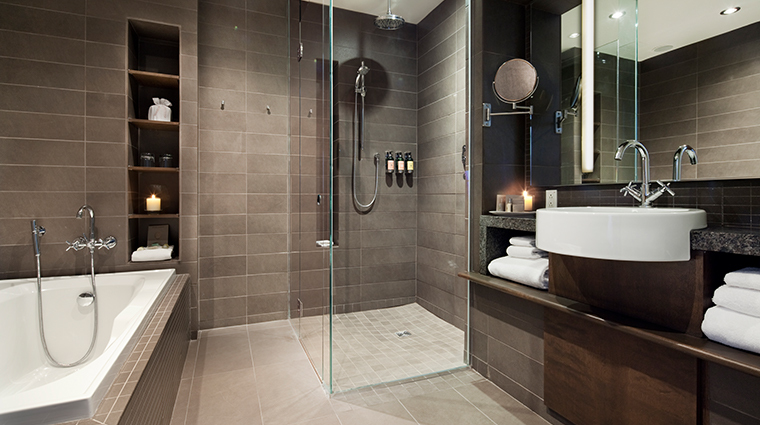 Every floor of the building has a woodsy essence that will transport you to the heart of Quebec’s boreal forest. If you don’t know where to start sightseeing in the culture-rich city, consult the hotel’s Clefs d’Or concierges, who can help you plan a fantastic itinerary. They can arrange for one-of-a-kind ways to see the city, like via helicopter or sailboat. 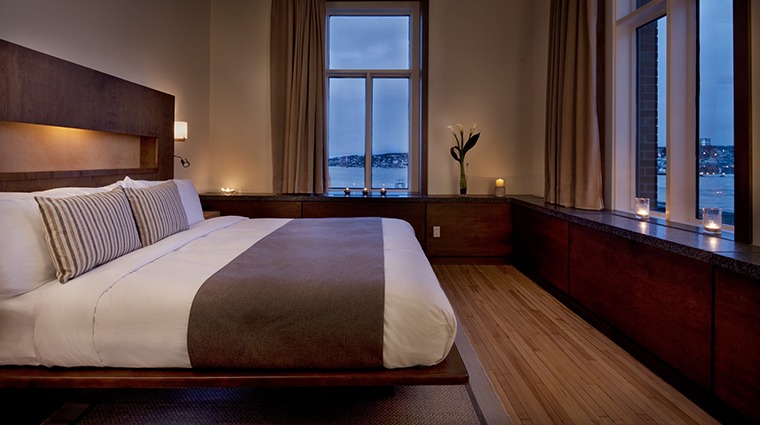 The seventh-floor east side rooms offer the most exciting view of the Old Port and the magnificent St. Lawrence River. On a clear day, you will see beyond the Île d’Orléans Bridge right up to the ski hills of Mont-Sainte-Anne. 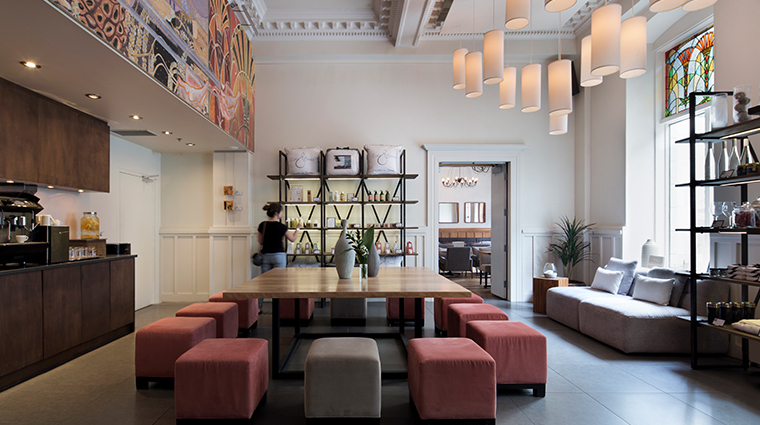 Situated in the lobby of the Old Port hotel, Il Matto serves casual Italian fare with a menu that highlights homestyle dishes like lasagna, spaghetti carbonara and a plump cinnamon-infused cannoli. Parking is tricky in this neighborhood, especially during summertime. The roads in the area are narrow with many only going one way, so taking advantage of the hotel’s valet service (including in-and-out privileges) is highly recommended. The Quebec City hotel partners with the Vincent et moi support program for artists living with mental health issues. The property features a gallery dedicated to four local creatives in the program and displays some of their vast, colorful paintings in the public spaces as well. 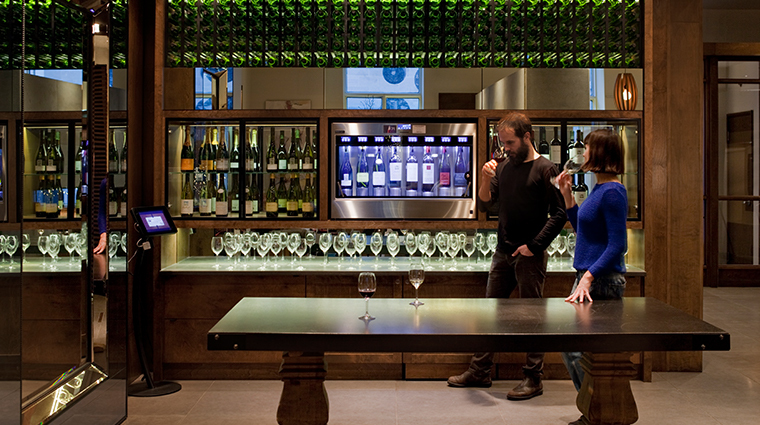 The hotel’s boutique lounge offers free Wi-Fi, 24/7 coffee and a pay-as-you-pour wine dispenser. There’s no need to go out in search of a morning meal — a daily continental breakfast buffet is included for those who book their stay through the hotel website or by phone. 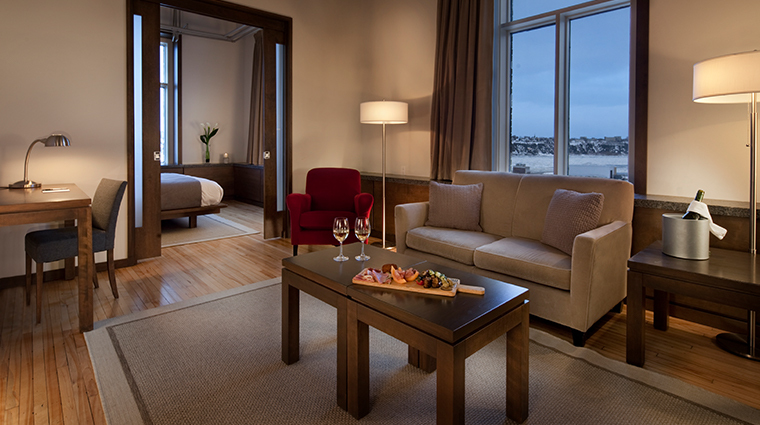 All rooms and suites are of contemporary design with high ceilings that give off a feeling of openness. Each is accentuated with large windows and locally crafted furniture. 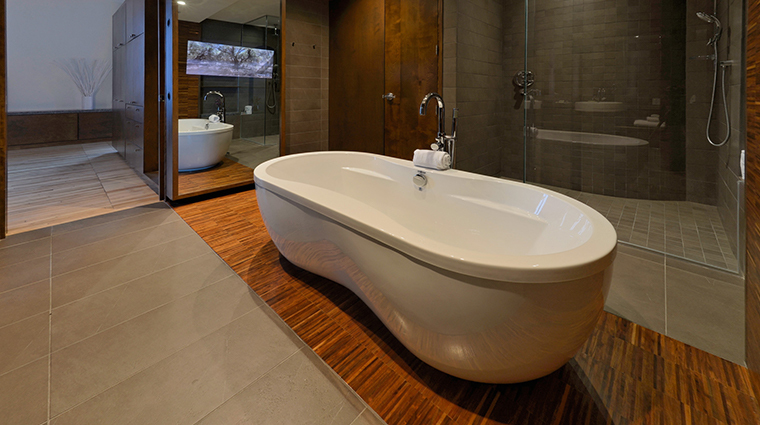 While the accommodations are more minimalist in style, they all feature luxurious touches like birch fabric linens, goose-down duvets and pillows, Italian glass showers (rain and jet) as well as bathrobes and amenities by L’Occitane en Provence. 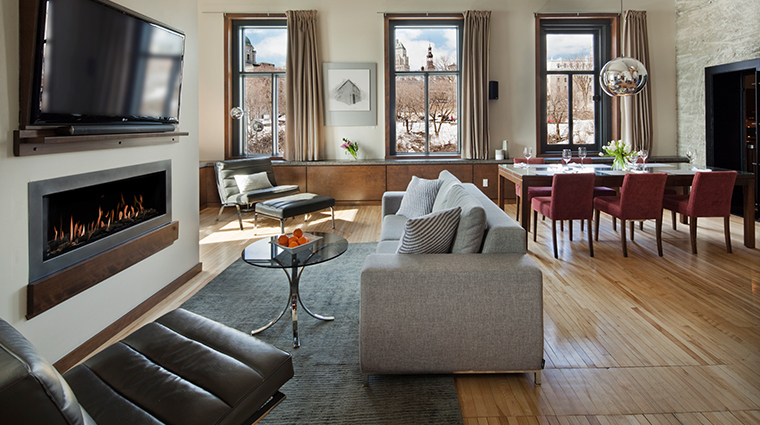 The ultimate in luxury can be found in the Penthouse Suite, which features a private 600-square-foot rooftop terrace that gives you access to a unique, breathtaking view of Old Quebec. Other highlights include an incredibly spacious bathroom with a deep soaking tub, a gas fireplace, a home theater system and a dining area and kitchenette (set up inside a former safe) equipped for up to eight guests. 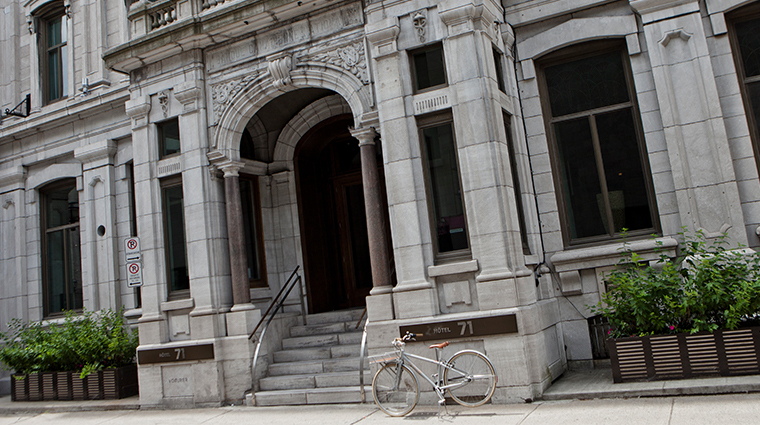 A two-minute walk brings you to Place Royale, one of the city’s most popular attractions. The plaza served as the birthplace to French America and now is home to museums, art galleries and more. Take a short stroll to Petit Champlain, a quaint neighborhood whose cobblestoned streets are lined with historic stone buildings, inviting bistros and small boutiques. Get a glimpse of the city’s military history with a visit to La Citadelle de Québec and the Plains of Abraham, the site of a 1760 battle between the French and British. The gorgeous park is just a 12-minute taxi ride (or 25-minute riverside walk) from the luxury hotel. 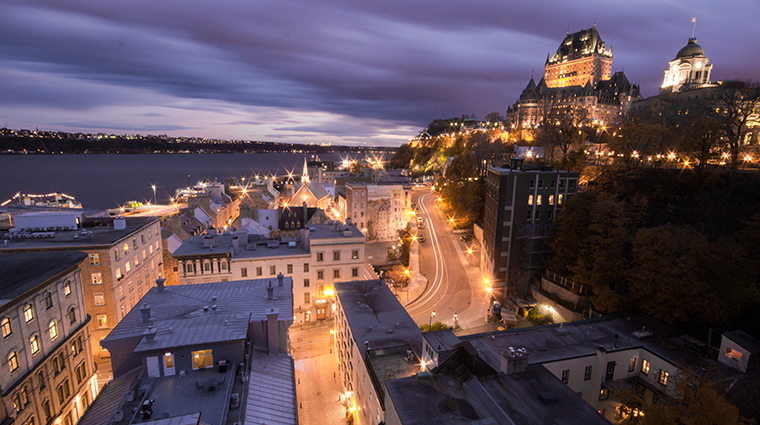 Several museums dot the historic area around the hotel, including La Musée de la Civilisation and the Naval Museum of Quebec.